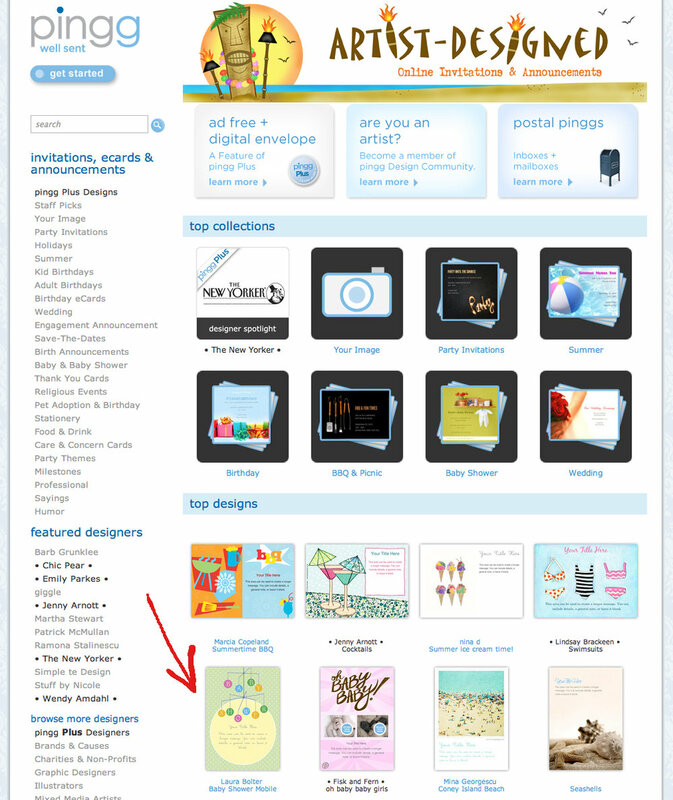 A freelance writer contacted me last month about featuring my Whale design in an article about best birth announcements. I finally remembered to look for it today when I looked through my Etsy shop stats and saw that I'd had some hits through iVillage. 30 Years. Where has the time gone? Looking back at those two fresh-faced kids makes me feel really old! On a beautiful day in Ft. Collins, Colorado, thirty years ago today, Boyd and I exchanged vows and started our life together. There were clouds and thunderstorms that day, but the storms added to the atmosphere of the event and eventually cleared. Like that day, through the last thirty years there has been choppy weather at times. We always seem to weather the rough times and come out stronger. I am blessed to have a caring, sensitive, supportive, spiritual, loving man by my side through it all. I couldn't have asked for a more perfect husband or father to share my life. 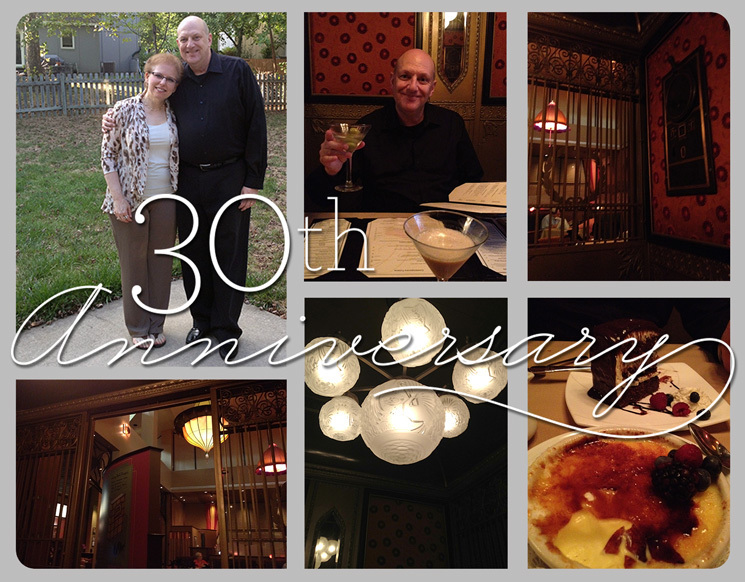 We celebrated at EBT, a restaurant we've heard about for many years, but had never dined at for one reason or another. It was a perfect dinner with a selection of delicious food on the menu—dishes that didn't include pork or shellfish but did have an abundance of choices other than exotic options for this girl with simple tastes. We dined in an antique elevator from an old Kansas City department store, sipping martinis with baked brie, then wine with our yummy dinners and ended with two scrumptious desserts. While we ate we talked about Pearl of course, but all of the good things, and not so great goings on in our life. What is perfect are our two daughters and son-in-law who make us so proud, both with their achievements but also with their senses of humor, their care of us, each other and the world, and their big hearts. What wonderful people they've turned out to be. The road of life never is even without hills and valleys, but the last several weeks have been filled with some big ups and some big downs. After more than two years of nursing an aging dog with many ailments, we lost our precious gem of a dog, Princess Pearl Petite on Sunday afternoon, August 26th at about 12:45. The hardest decision we've ever had to make, became a bit easier after several days of greater decline. Those last moments are burned into my memory and are so painful. If I go into the details I won't be able to get on to the good stuff, so I won't share those now. It doesn't matter too much now anyway. What does matter is that Pearl was the most loved dog in the world, and we did everything we could to make her life long and with the best quality it could possibly be. Below I've copied the words I used on that day and the day after. From Facebook on August 26th: The sweetest dog in the world is now an angel and my heart is completely broken. In response to all of the supportive comments on August 27th: I'm sorry I haven't thanked you all for your warm, caring, supportive comments sooner. It's been too painful to do it, and I'm crying now as I write this. I always knew this day would arrive, and knew it would hurt, but I never imagined just how much and how big the ache would be. I miss her "smile", her trust, playfulness, loyalty and so much more. I miss my "shadow" as I walk into my studio or her waiting for me there, knowing it was time to work. I will miss going out to run errands through drive thru's, not because they needed to be done right then, but because i knew she'd enjoy it and reward me with her smiles afterward. Mostly right now I want to bury my nose in that sweet, soft, yummy fur and inhale a deep whiff of her. Every night as she fell asleep between by legs and lay her head on my leg, knowing she felt so safe there, she dug a hole deeper into my heart that will never be filled again. My sweet, lovable Pearl—your were truly the best gem of a dog, and you will shine in my memory to the end of time. Thank you all for understanding just how much a dog becomes a part of your family. I'm blessed to have a community of family and friends who care so deeply. And, if you have a pet, please give them a kiss tonight for me. What did help to ease some of the pain was working with the most compassionate vet. 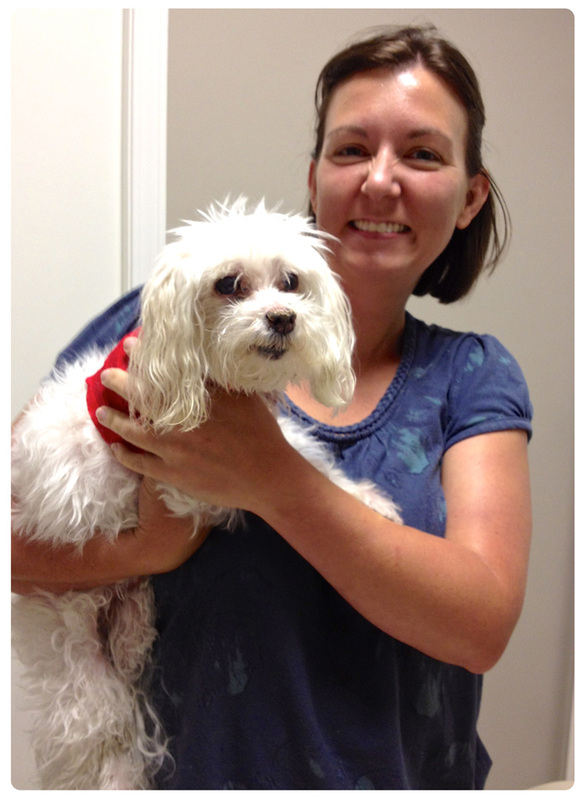 Dr. Tabatha Regehr at Perimeter Veterinary Center, was a godsend. Over the past two years she'd given us her cell number and email address so we could call anytime of the day or night. She emailed to check in when it had been a while since she'd seen us. Tabatha took Pearl home with her overnight after she did the last surgery in October so she could care for her because we were so nervous about the large incision. She cried with us and comforted us and checked in on us and is a true angel. She even made a donation to K-State's Pet Tribute in Pearl's memory. We are planning to do the same in her honor. A few days later I went to the groomer that we'd been taking Pearl to for years. I planned my trip for right at five o'clock when she'd be closing, so it wouldn't ruin her day and so we'd have time to talk. When I walked in a new assistant, who I hadn't met yet, came out to answer the door. I told her I was there to see Jean and she went to the back room to get her. Jean knew why I was there, opened the door, waited for me to nod my head to confirm, and then came out crying. We held each other and cried together. A card arrived from her a few days later saying how she appreciated us entrusting Pearl to her for so many years and that the memories would be very dear to her. How wonderful to be surrounded in life by people who are so empathetic and supportive! We are blessed. And, so now I sit here at my computer, and could continue to for as long as I want since Pearl isn't here to remind me it's time to go to bed. I suppose it is easier to work when I want to without distraction, to sleep through the night without having to trod down the stairs holding her sweet smelling, furry little body and hope I don't trip and fall, to come and go from the house without worrying about the little one who needs constant love and attention. But, the house feels so empty all by myself without my little companion and it will be a very long time until I stop expecting her to come clean up the kitchen floor when I drop food, or welcome me home or miss the weight of her little body nestled between my legs in bed at night. Rest in peace sweet Pearl. So they got the name of my shop wrong (Pearl is a Pear! ), but they did say that my design is on trend right now! Thanks Babble.com! 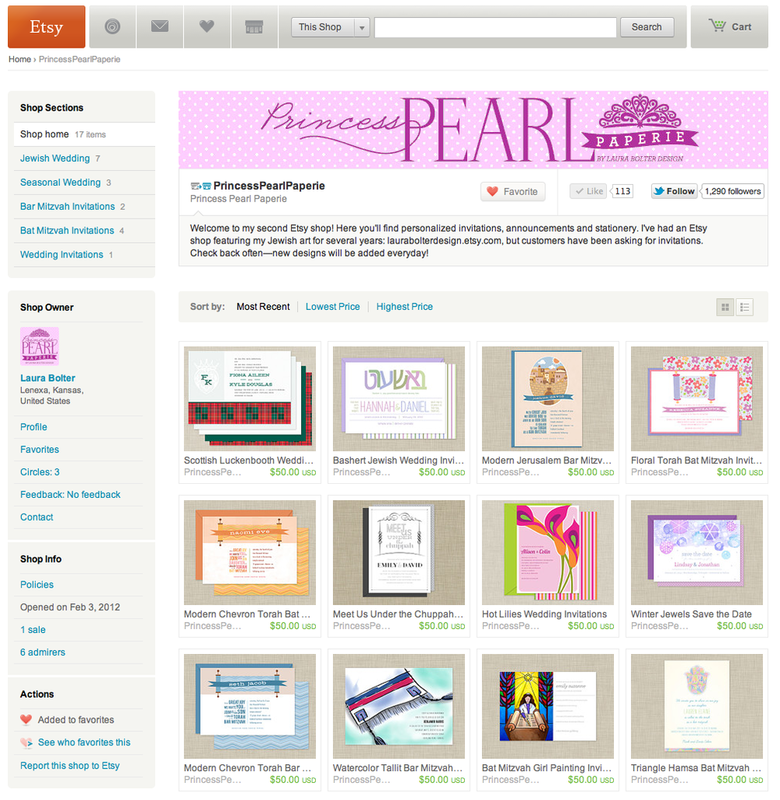 Thanks to Pingg for featuring my Go for the Gold invitation on the blog and FB page! A couple of years ago I was contacted by Jewish Toys, a company in Chicago, to do design work for them. Unfortunately at the time I was in the middle of working on Hannah and Dann's wedding and had to turn them away, because I was just too busy. Just recently they contacted me again with a new project. 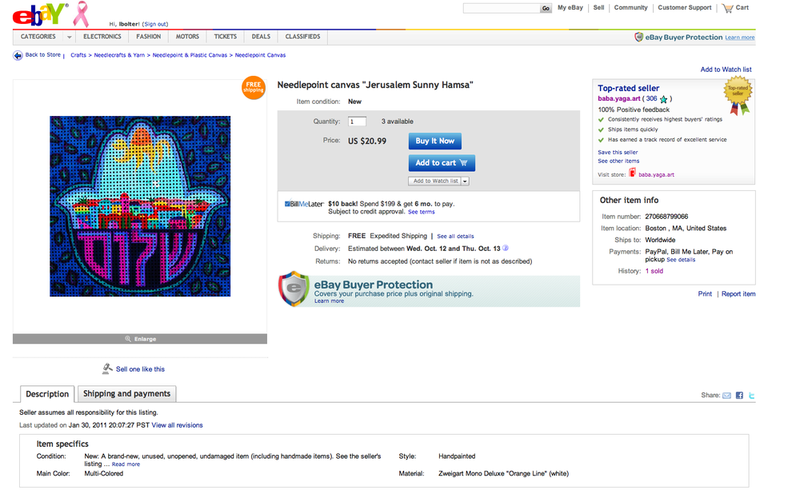 Their timing was perfect this time, and they sent instructions for designing a store display for "Paint Your Own Tzedakah Boxes." 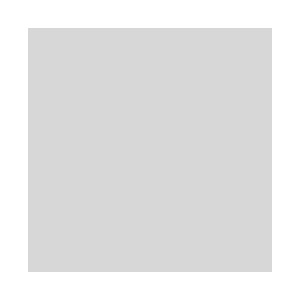 Part of the specs were to create illustrations of boxes with samples of art that might be painted on the blank wooden boxes, so I had to look over 3D art effects Help in Illustrator, since it's been a while since of done that type of thing. They decided not to have me paint actual boxes because painting and photographing them would take much longer. The company has been great to work with and they're pleased with the results—I hope to be getting future assignments later this week. After about 6 months of submitting designs for Minted challenges, I received an exciting email yesterday. 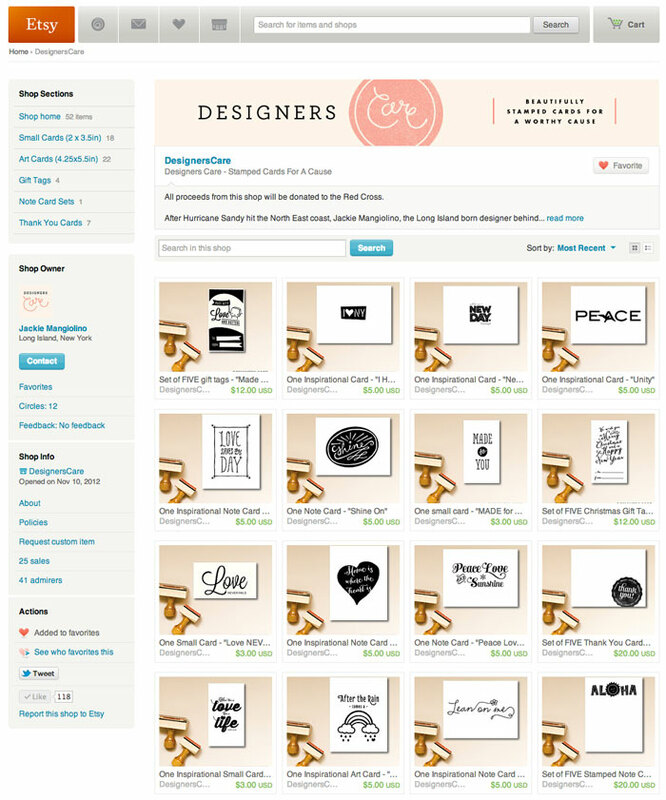 My Doodle Flowers women's stationery design has been chosen as a late editor's pick! Finally I will have a design for sale on their site. I've spent the day working out the two alternate colorways along with the designs for the backside of the stationery sheets and the matching skinny address labels. I think they'll be available for sale very soon! With the warmer weather and the hacked website cleaned up, now seemed a good time for some more Spring cleaning. I've update the website with a clean look and new banners. 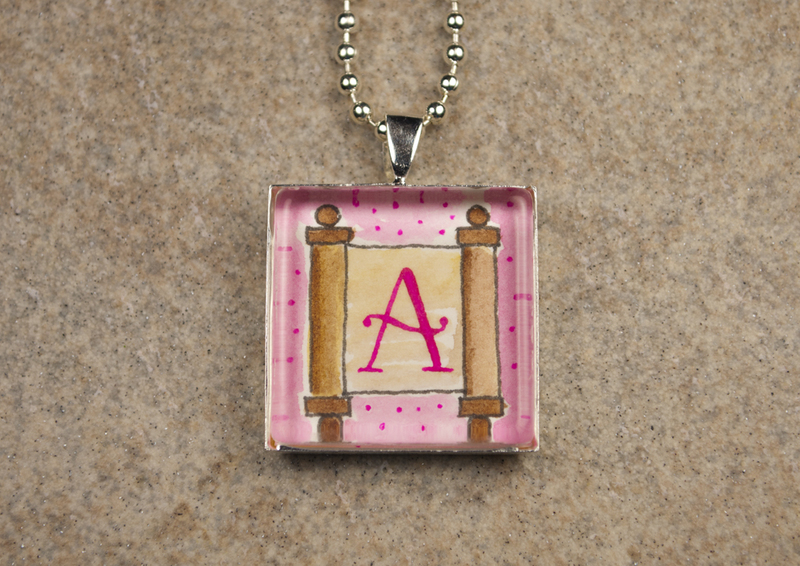 Same goes for the Facebook page and the Etsy shop. It's still a work in progress. I checked out Pingg today—it's been a little while since I've visited. Several weeks ago I thought I'd post some designs that were rejected by other clients (the horror of rejection—yes, I've experienced that!) Well, turns out that one of those rejected images is a top design right now on Pingg, and it's featured on their front page! 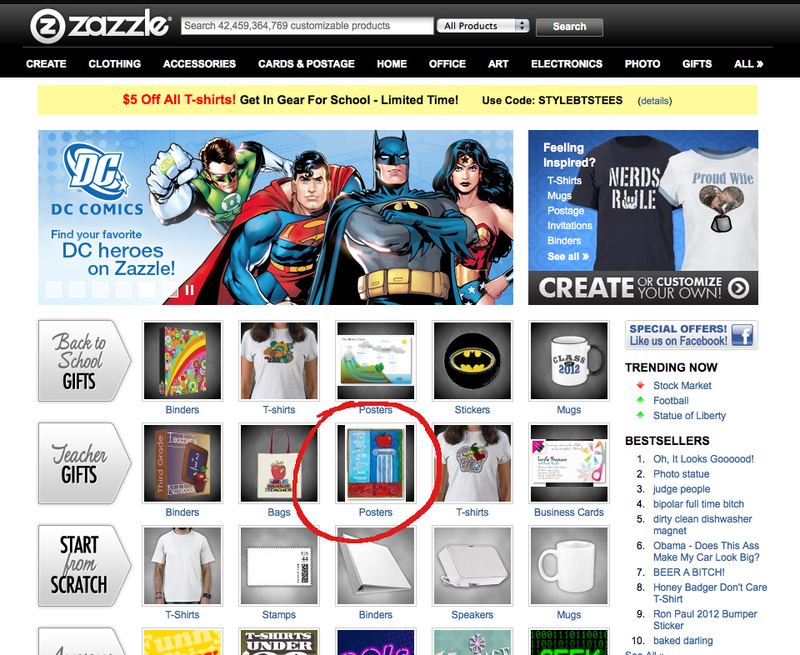 Just saw that my teacher illustration is on the Zazzle front page. I don't know how long it'll be there, so go check it out now! Welcome to my new (virtual) home! There's a handy-dandy contact page, so please share your comments with me—what do you like or not like? I'd love to hear what you're interested in reading about, too. So make sure to subscribe either by feed or email using the links on the top of the sidebar to the left. I hope you keep coming back to see what I've got on my easel and computer screen.